1 M. D. Maines, "Heme Oxygenase: Clinical Applications and Functions." CRC Press, Boca Raton, FL, 1992. 2 M. D. Maines, G. M. Trakshel, and R. K. Kutty, J. Biol. Chem. 261,411 (1986). 3 W. J. McCoubrey, T. J. Huang, and M. D. Maines, Eur. J. Biochem. 247, 725 (1997). 5 M. D. Maines, Annu. Rev. Pharmacol. Toxicol. 37, 517 (1997). 6 P. A. Dennery, A. F. McDonagh, D. R. Spitz, and D. K. Stevenson, Free Radic. Biol. Med. 19, 395 (1995). 7 D. Willis, in "Inducible Enzymes in the Inflammatory Response" (D. A. Wiloughby and A. Tomlinson, eds. ), p. 55. Birkhauser Verlag, Basel, 1999. 8 S. I. Walaas and P. Greengard, Pharmacol. Rev. 43, 299 (1991). 9 S. H. Snyder, S. R. Jaffrey, and R. Zakhary, Brain Res. Brain Res. Rev. 26, 167 (1998). course of heme oxidation is sequestered by transferrin or ferritin, or is reutilized.10 When free, the iron is a potent catalyst for oxygen free radical formation. On the basis of findings with ischemia-reperfusion kidney injury,22 it is reasonable to suspect that protection afforded by upregulation of HO-1 involves, in part, degradation of hemoglobin heme and increased ability to generate bilirubin. 10 P. Ponka, C. Beaumont, and D. R. Richardson, Semin. Hematol. 35, 35 (1998). 11 K. D. Poss and S. Tonegawa, Proc. Natl. Acad. Sci. U.S.A. 94, 10925 (1997). 12 N. Panahian, M. Yoshiura, and M. D. Maines, J. Neurochem. 72, 1187 (1999). 13 S. Dore, K. Sampei, S. Goto, N. J. Alkayed, D. Guastella, S. Blackshaw, M. Gallagher, R. J. Traystman, P. D. Hum, R. C. Koehler, and S. H. Snyder, Mol. Med. 5, 656 (1999). 14 L. E. Otterbein, J. K. Kolls, L. L. Mantell, J. L. Cook, J. Alam, and A. M. K. Choi, J. Clin. Invest. 103, 1047 (1999). 15 N. Panahian and M. D. Maines, J. Neurochem. 76, 539 (2000). 16 W. J. McCoubrey, T. J. Huang, and M. D. Maines, J. Biol. Chem. Ill, 1568 (1997). 17 Y. Ding, W. K. McCoubrey, and M. D. Maines, Eur. J. Biochem. 264, 854 (1999). 18 M. D. Maines, B. Polevoda, T. Coban, K. Johnson, S. Stoliar, T. J. Huang, N. Panahian, D. Cory Slechta, and W. J. McCoubrey, J. Neurochem. 70, 2057 (1998). 19 K. Chen, K. Gunter, and M. D. Maines, J. Neurochem. 75, 304 (1999). 20 S. M. deLaMonte, Y. K. Sohn, N. Ganju, and J. R. Wands, Lab. Invest. 22,401 (1998). 21 H. Suzuki, K. Kanamaru, H. Tsunoda, H. Inada, M. Kuroki, H. Sun, S. Waga, and T. Tanaka, J. Clin. Invest. 104, 59 (1999). 22 M. D. Maines, R. D. Mayer, J. F. Ewing, and W. J. McCoubrey, J. Pharmacol. Exp. Ther. 264,457 (1993). The focus of this chapter is on methods that this laboratory has successfully used to detect neuroprotection against oxidative stress. Although the point of reference is HO-1 Tg mice, the described procedures can be applied in other settings where the beneficial or detrimental effects of altered gene expression—any gene— are examined subsequent to exposure to a neurotoxin—any neurotoxin. The methods are divided into two parts: Part 1 pertains to experiments with intact brain and Part 2 pertains to studies with isolated granule neurons. 1. It is essential to perfuse brain completely for use in immunocytochemical (ICC) experiments. For this, mice are perfused through the left atrium with hep-arinized saline administered through a 26-gauge angiocatheter positioned into the apex of the left ventricle. 2. This is followed by reperfusion with 40 ml of a chilled solution of 4% (w/v) paraformaldehyde (PFA) in 0.1 M phosphate-buffered saline (PBS, pH 7.4). 3. The brain is postfixed in 4% (w/v) PFA for 4 hr at 4-6°. 4. This is followed by treatment with a cryoprotection solution, consisting of 30% (v/v) ethylene glycol and 20% (w/v) sucrose in 0.1 M PBS (pH 7.4) at 4° for 2-3 days. 5. The frozen specimens are cut serially into 35-/im-thick longitudinal or horizontal sections, using a cryostat sliding microtome (e.g., Microm HM400R; Carl Zeiss, Thornwood, NY). The brain tissue of Tg and non-Tg mice should be processed at the same time under identical conditions and using the same reagents and solutions. HO-1 is detected with anti-HO-1 monoclonal or polyclonal antibodies (StressGen, Victoria, BC, Canada) as follows. 23 N. Panahian, T. Huang, and M. Maines, Brain Res. 850, 1 (1999). 24 B. Brune and V. Ullrich, Mol. Pharmacol. 32,497 (1987). 25 W. Durante, N. Christodoulides, K. Cheng, K. J. Peyton, R. K. Sunahara, and A. I. Schafer, Am. J. Physiol. 273, H317 (1997). solution in TBS, all specimens are transferred [in Costar (Cambridge, MA) net wells] into the primary HO-1 antibody diluted 1:1000 in carrier solution [0.1 M TBS containing 0.5% (v/v) horse serum, 0.25% (v/v) Triton X-100], and incubated for 48 hr at 4-6°. 7. The specimens are then rinsed five times (10 min each) with 0.1M TBS containing 0.25% (v/v) Triton X-100 and placed into a biotinylated secondary antibody reagent according to the manufacturer recommendations (e.g., Vectastain Elite, mouse IgG kit; Vector Laboratories, Burlingame, CA). For peroxidase reactions, the typical incubation is 3 hr at room temperature. After five 10-min washes in 0.1 M TBS, specimens are incubated at room temperature for 90 min with the avidin-biotin reagent prepared in 0.1MPBS (ABC solution; Vector Laboratories). 8. After consecutive 10-minrinsesinTBS and Tris-HCl, the sections are placed into a filtered solution of 0.04% (v/v) 3',3'-diaminobenzidine (DAB) and 0.06% (v/v) H2O2 in 0.1 M Tris buffer for 4-5 min. A stereomicroscope (e.g., MZ-8; Leica, Bensheim, Germany) can be used to detect the reaction product during development. 9. Sections are rinsed in phosphate buffer, dehydrated serially in 95% and 100% alcohol, incubated in histological grade xylene, mounted on Superfrost Plus slides, and coverslipped with Permount (Fisher Scientific, Pittsburgh, PA). As exemplified below, oncogene products that are linked to cell death can be visualized15 with monoclonal antibodies. Sections are incubated overnight at 4-6° with the desired antibodies at the dilution indicated below. After several consecutive washes with TBS containing 0.3% (v/v) Triton X-100, the sections are processed for peroxidase detection. Anti-mouse p53 monoclonal IgGi (sc-100) is obtained from Santa Cruz Biotechnologies (Santa Cruz, C A) and used at a 1:500 dilution. Anti-TRAIL (sc-1891) and anti-FADD (sc-6036), affinity-purified goat polyclonal antibodies of mouse origin, can be obtained from the same supplier. The TRAIL antibody is raised against a peptide corresponding to amino acids 273-291 mapping at the carboxy terminus of a TNF-related apoptosis-inducing ligand, whereas anti-FADD is raised against a peptide corresponding to amino acids 187-205 mapping at the carboxy terminus of the Fas-associated death domain-containing protein. Double immunolabeling using HO-1 monoclonal antibody with either p53, FADD, or TRAIL can be performed15 using the Vector Laboratories peroxidase detection system. As recommended by the supplier (Vector Laboratories), DAB is used as a primary chromogen, whereas Vector SG is used as the secondary chromogen. 26 L. M. Sayre, G. Perry, and M. A. Smith, Methods Enzymol. 309, 133 (1999). ferrocyanide. The reaction is further enhanced by oxidation with DAB. Staining for Fe3+ is incompatible with tissue processing for ICC procedures.15 Adjacent sections are stained to detect oxygen radical-mediated lipid peroxidation.12 Freefloating brain sections are incubated for 45 min in the dark at room temperature in Schiff s reagent (paraosaniline base, thionyl chloride) prepared as described by Pearse.27 Staining for iron and lipid peroxidation are not compatible with tissue processing for ICC. Choice of fixative is an empirical process. Fixation is generally done overnight, although for low-affinity antibodies that are sensitive to the fixative, times as short as 2 hr may be employed. They are listed below and are assessed for a given application. Vector Laboratories (Burlingame, CA) is a good source for many fixatives as well as histochemical stains. 27 A. G. E. Pearse, "Histochemistry: Theoretical and Applied," 4th Ed., Vol. 1, p. 655. Churchill Livingstone, New York, 1980. Sections must be xylene processed before coverslipping. The agent is spread across the bottom of the slide and the coverslip is applied by slowly rolling from bottom to top to spread the agent. The commonly used agents are listed below. Cytoseal: This is the most commonly used agent and easy to apply. Because of problems with optical quality, it does not work well for high-magnification (e.g., > x 400) photomicroscopy Permount: This has better optical properties than Cytoseal. Excellent for high-magnification microscopy especially when mixed with 2 parts xylene Vectashield: This is not truly a mounting solution as it does not solidify. Useful for fluorescence as it helps prolong the half-life of the fluorescent compound. General tissue/cell morphology can be visualized by hematoxylin and eosin (H&E) staining. It can be performed on formalin- or paraformaldehyde-fixed sections, but not on Zamboni-fixed tissue. It works best on fresh frozen, cryostat-cut, or paraffin-embedded sections. All solutions mentioned below are available from Sigma (St. Louis, MO). 1. Fix sections for 2 min in equal parts solution. Omit this fixation if the sections have previously been stained for ICC. 2. Rinse with copious amounts of tap water. 3. Stain for 3 min in Harris hematoxylin solution. 4. Rinse for 2 min with water. 5. Destain with 1% (v/v) acid alcohol by immersing the sections once in the solution. 6. Stop the destaining by immersing the sections in water. Rinse 2-3 min. 7. Fix the membranes with 0.05% (w/v) lithium carbonate for 1 min. 9. Stain with eosin solution for 45 sec to 1 min. 10. Wash twice (11 or 12 dips per wash) with 95% (v/v) ethanol and then with 100% ethanol. 11. Place the sections in xylene for a minimum of 5 min (paraffin) or 15 min (fresh frozen) or, if convenient, overnight; slides can be stored for several days and up to 1 month before coverslipping. There are a large number of assays that can be used to detect damaged cells and apoptosis.28,29 Here, only detection of DNA damage is described. 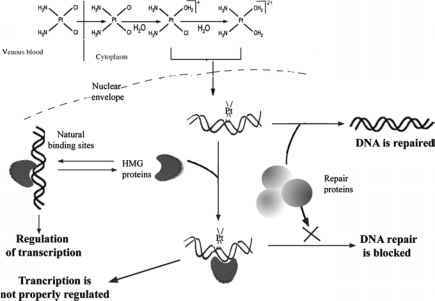 The formation of high molecular weight (>50 kb) DNA fragments and intranucleosomal fragmentation or DNA laddering (200-bp DNA fragments) are described. DNA from necrotic cells has a random and general cleavage and appears smeared when electrophoresed. DNA is obtained from flash-frozen tissues and quantitated spec-trophotometrically by measuring absorption at 260 nm. For the detection of ladder formation, 15-yu.g samples are electrophoresed at 45 V for 15 min and then at 65 V for an additional 2 hr. After ethidium bromide staining, gels are photographed. High molecular weight fragmentation is detected by heating 1 jig of DNA to 65° for 10 min before agarose gel electrophoresis in Tris-acetate-EDTA (0.5%, v/v). Pulse-field agarose gel electrophoresis30 is carried out at 4° for 96 hr at 20 V with the buffer circulating. For sizing, high molecular weight DNA markers (Invitrogen, Carlsbad, CA) are used. 28 J. Chen, K. Jin, M. Chen, W. Pei, K. Kawaguchi, D. A. Greenberg, and R. P. Simon, J. Neurochem. 69, 232 (1997). 29 B. Zhivotovsky, A. Samali, and S. Orrenius, in "Current Protocols in Toxicology" (M. D. Maines, L. Costa, D.J. Reed, S. Sassa, and J. G. Sipes, eds. ), p. 2.1.1. John Wiley & Sons, New York, 1999. 30 R. Arand and E. M. Southern, in "Pulse Field Gel Electrophoresis of Nucleic Acids: A Practical Approach" (D. Rickwood and B. D. Haines, eds. ), 2nd Ed., p. 101. IRL Press, Oxford, 1990. 31 B. Gavrieli, Y. Sherman, and S. BenSasson,./. Cell Biol. 119, 493 (1992). reaction mixture containing 2.5-5 ¡iCl of a-32P-labeled dCTP, incubated for 1-2 hr at room temperature in the presence or absence of DNA polymerase I, washed 3 or 4 times for 10 min each with buffered saline, dehydrated with 70 and 100% ethanol, and exposed to X-ray film. All manipulations (in situ nick translation, exposure to X-ray film, etc.) should be performed under the same conditions for a given experiment. Autoradiograms can be evaluated by image analysis and by measuring the intensity of the labeling. No radioactivity should be detected in sections incubated without DNA polymerase. 1. Seven-day-old mice are killed by decapitation. 2. Dissect out the cerebellum and place it in 1 ml of digestion buffer in a microcentrifuge tube. The digestion buffer consists of papain (1 mg/ml), DNase I (12.5 Mg/ml), bovine serum albumin (BSA, 0.2 mg/ml), L-cysteine HC1 (0.2 mg/ml), and glucose (5 mg/ml). 3. Mince the tissue into small pieces with fine scissors. 4. Incubate in a 37° water bath for 20 min. 5. Transfer to a 15-ml conical centrifuge tube, add 4 ml of culture medium, and mix with a pipette. The medium consists of Eagle's basal medium, 10% (v/v) fetal bovine serum, 25 mM KC1, 1:100 penicillin-streptomycin (Pen/Strep) solution. 6. Centrifuge in Beckman J2-M1 at 1000 rpm for 10 min at 4°. 7. Decant the supernatant and resuspend the cells in 2.5 ml of culture medium. 8. Determine the cell concentration with a hemocytometer. 9. Seed poly-L-lysine (10 ju.g/ml)-coated culture plates with 3 x 10s cells/cm2. 10. Incubate at 37° in a 5% CO2 atmosphere overnight. 11. Add cytosine arabinofuranoside (AraC; 1 M in water) to a concentration of 10 ¡iM to inhibit growth of nonneuronal cells. 12. Incubate the neurons for 7 days before experimentation. Cells can be used only on day 7 or 8 and after that must be discarded. 32 T. M. Miller, K. L. Moulder, C. M. Knudson, D. J. Creedon, M. Deshmukh, S. J. Korsmeyer, and E. M. Johnson, J. Cell Biol. 139, 205 (1997). 33 M. Ankarcrona, J. M. Dypbukt, E. Bonfoco, B. Zhivotsky, S. Orrenius, S. A. Liptos, and P. Nicotera, Neuron 15, 961 (1995). 1. Remove and save the culture medium from cells grown for 7 days in 48-well plates. 3. Treat cells at 37° with 150 fil of 30 /iM or 3mM glutamate in Locke's solution for 30 min. 4. Remove glutamate and return to culture medium. Do not use fresh medium as fresh serum is toxic for the cells at this stage. 5. Incubate at 37° for 3 hr before measuring viability, necrosis or nuclear condensation. 1. Dissolve MTT (3-4,5-dimethylthiazol-2,5-diphenyltetrazolium bromide) in serum-free medium at 0.25 mg/ml. 2. Remove the medium from cells and add 150 ¡x\ of MTT per well. 3. Incubate at 37° for 30 min in a 5% C02 atmosphere, and then add 150 /zl of solubilization solution [20% (w/v) sodium dodecyl sulfate (SDS) in 50% (v/v) dimethyl formamide, adjusted to pH 4.8] to each well. 4. Incubate at 37° for 4-5 hr (C02 is not required at this step). 5. Measure the absorbance at 570 nm. Viable cells metabolize MTT, producing a purple color. There is a direct correlation between the absorbtion value and cell viability. 1. Add a l/100th volume of a solution of 1-mg/ml fluorescein diacetate and 1-mg/ml propidium iodide to the culture medium (final concentration is 10 /ig/ml for each dye). 3. Examine by fluorescence microscopy, using a UV lamp and fluorescein isothiocyanate (FITC) filter. Viable cells are green whereas necrotic cells are red. 1. Remove the medium from cells and permeabilize for 15 min with 80% (v/v) methanol. 2. Wash briefly with phosphate-buffered saline (PBS). 3. Stain for 5 min with propidium iodide (10 /ig/ml in PBS). 5. Examine by fluorescence microscopy, using a UV lamp and FITC filter. DNA in the nuclei of all cells will be red; in normal cells, the distribution will be patchy, reflecting the diffuse nature of chromatin, whereas the chromatin of apoptotic cells will appear to be highly condensed. The assay can be used to detect reactive oxygen species (ROS) formation in response to any number of agents35; herein it is described with respect to glutamate-induced ROS formation. 1. Remove medium and wash briefly with Locke's solution. 2. Add 200 fjA of Locke's solution containing 3 mM glutamate and dichlo-rofluorescein diacetate (DCF, 1 /xg/ml) to each well. 3. Incubate at 37° and read the fluorescence of the solution at wavelengths of 485 nm (excitation) and 535 nm (emission) at 30-min intervals for a total of 90 min after addition of the glutamate solution. An instrument such as a Wallac (Turku, Finland) 1420 multilable counter can be used. 4. Plot fluorescence versus time. Fluorescence is proportional to ROS, so a flatter slope indicates slower generation of ROS. It should be noted that fluorescence units are relative and therefore only samples in the same plate can be compared. 1. Sterilize 25-mm glass cloverslips overnight under a UV lamp in a tissue culture hood. 2. Place a coverslip at the bottom of each well of a six-well tissue culture dish. 3. Precoat the coverslips overnight with 250 ¡jl\ of poly-L-lysine (10 ¿¿g/ml in water). 4. In accordance with the protocol for culturing neurons, prepare the cells and seed 3 x 105 cells/cm2 in a 250-//1 volume onto each coverslip. 5. Incubate at 37° for 30 min, and then add 2 ml of culture medium without antibiotics. 6. Add AraC and grow the cells for 7 days as for standard neuron culture. 7. Add 1 mM fura-2 acetomethyl ester (Molecular Probes, Eugene, OR) to a final concentration of 5 ¡iM (10 ¡x\ for 2 ml of culture medium). 9. Wash with Locke's solution and then transfer the coverslip to a microscope holder. We have used a Nikon fluorescence photometric system with an inverted Fluor x40, 1.3 numerical aperture objective. 35 D. J. Kane, T. A. Sarafian, R. Anton, H. Hahn, E. B. Gralla, J. S. Valentine, T. Ord, and D. E.
Bredesen, Science 262, 1274 (1993). 10. Add sufficient (0.5 ml) 30 ¡jlM glutamate in Locke's solution to cover the surface of the coverslip. 11. Collect data for up to 10 min. The excitation wavelength is set at 340 nm and the emission wavelength is set at 375 nm. Data are collected at 510 nm. 1. Cells are grown on coverslips as for calcium measurements or on 18-mm coverslips in 12-well plates. 2. Wash the cells with PBS. 3. Fix the cells with 4% (w/v) paraformaldehyde on ice for 10 min. 4. Wash three times with PBS. 5. Block with 5% (v/v) horse serum in PBS containing 0.25% (v/v) Triton X-100 (PBS-T) for 1-2 hr at room temperature. 6. Remove the blocking solution and add primary antibody diluted in PBS-T containing 3% (v/v) horse serum. Dilutions used are as follows: HO-1 monoclonal, 1:250; monoclonal neuronal microfilament, 1:200; and HO-1 polyclonal, 1:5000. 7. Incubate at 4° overnight. 8. Wash three times with PBS-T.
9. Add 980 /il of PBS-T, 15 /xl of horse serum, and 5 /xl of secondary antibody Vector ABC [horseradish peroxidase (HRP)-conjugated anti-mouse IgG for monoclonals or antirabbit for rabbit polyclonal primary antibody] to each well. 10. Incubate at room temperature for 1 hr. 11. During the 1-hr incubation, prepare A/B solution. Mix 1 drop each of solutions A and B into 2.5 ml of PBS (each well will receive 0.6 ml) and allow the solution to remain at room temperature for 30 min before use. 12. Wash the wells four times with PBS-T and then add 0.6 ml of A/B solution to each well. 13. Incubate at room temperature for 30 min. 14. Wash three times with PBS-T.
15. Prepare chromogen [VIP substrate for peroxidase (SK4600; Vector Laboratories)] by adding 3 drops each of reagents 1, 2, and 3 to 5 ml of PBS. Mix and add 3 drops of H2O2 and vortex briefly. 16. Add 1 ml of chromogen to each well and watch the color development under a microscope. 17. When color development is sufficient, stop the reaction by replacing the staining solution with water or PB. 18. Remove the coverslips and dehydrate by dipping then six times in 95% (v/v) ethanol and then six times in 100% ethanol. 19. Dip the coverslips six times in xylene and mount, inverted, onto a slide with Permount. For Western analysis, the contents of all six wells of a six-well plate are pooled. 1. Wash the cells in PBS. 2. Scrape the cells from the wells, using a rubber policeman, and place the cell in a microcentrifuge tube. 4. Resuspend in a minimal volume (50 /xl if possible) of lysis buffer. 5. Sonicate twice, 10-15 sec each. 7. Remove the supernatant and store at —80°. 8. Use approximately 30 /xl for a Western blot. Use the ECL system (Amersham, Arlington Heights, IL) for detection of transferred proteins. Follow the manufacturer instructions. 1. Add 1 ml of TRIzol reagent to 100 mg of cells. This amount of cells is obtained from a 25-cm2 flask (use 0.5 ml for a six-well plate). 2. Homogenize the tissue with a Dounce homogenizer and transfer to a microcentrifuge tube. 3. Add 0.2 ml of chloroform, mix, and hold at room temperature for 3 min. 4. Centrifuge at maximum speed in the microcentrifuge for 15 min at 4°. 5. Add an equal volume of isopropanol to the supernatant in a fresh tube. 6. Mix and place on ice for 10 min. 7. Centrifuge at maximum speed for 10 min at 4°. 8. Add 0.5 ml of ice-cold 70% (v/v) ethanol to the pellet. 9. Vortex vigorously and repeat the centrifugation. 10. Air dry the pellet for 10-20 min. 11. Dissolve the pellet in water (typically 200 /xl for 100 mg of tissue). 12. Quantitate by UV spectroscopy. 1. In a 0.5-ml microcentrifuge tube mix 2 /xg of total RNA and 1 /xl of oligo(dT) primer [Invitrogen (San Diego, CA) cDNA cycle kit] with sufficient water to make 10/xl. 4. Incubate the tube at 42° for 50 min and then heat denature it for 2 min at 95° and place on ice. 5. PCR is carried out with 1 pi of the cDNA in a 25-/xl reaction volume containing 0.5 pi (50 pmol) of each primer and 0.25 //I of Tag polymerase (2.5 U/ml). 6. The number of cycles varies with tissue and primers; usually 20-30 cycles are used. Products are analyzed on 1.2-1.6% (w/v) agarose gels in Tris-acetate buffer with EDTA (TAE). RNA Probe Labeling. The RNA probe labeling protocol can be used for any cloned cDNA along with appropriate vectors and restriction enzymes. 1. Set up four restriction digests of 20 pi, each containing 2-3 pg of plasmid DNA. Use appropriate restriction enzyme and buffer. Incubate at 37° overnight. 2. Gel purify the DNA fragment on a 2% (w/v) agarose gel in TAE. 3. Phenol extract the pooled products and ethanol precipitate. 4. Resuspend the pellet in 20 pi of water; 2-4 pi is used for a standard labeling reaction. 5. Using the Stratagene (La Jolla, CA) RNA transcription kit, mix the following: 1 pi each 10 mM ATP, GTP, and CTP, 1 pi of 0.75 MDTT, 5 pi of [a-32P]UTP (3000 Ci/mmol), 2 pi of T7 RNA polymerase, 2-4 pi of template (add this last), and water to a final volume of 25 pi. 6. Incubate at 37° for 1 hr and then heat denature the polymerase at 95° for 2 min. 7. Place on ice for 5 min, and then add 1 pi of DNasel (10 mg/ml). 8. Incubate at 37° for 15 min and then heat denature at 85° for 4 min before loading on a gel. Loading dye is not required because of the glycerol present in the reaction buffer. A complete reaction mixture can be loaded in a single lane. The gel is 8% (w/v) acrylamide [19:1 (w/w)] plus 7 M urea in 1 x TBE and is poured with 1.5-mm spacers. Load bromphenol blue (BPB) dye in an adjacent lane to allow monitoring of the gel progress. 9. Run the gel at 175 V until the tracking dye is approximately two-thirds down the gel. 10. Cut the gel to a convenient size, wrap it in plastic wrap, and perform a rapid autoradiogram exposure. 11. Using a razor blade, cut out the labeled probe band, which is the fainter band about one-third of the way down the gel, and place it in 1.5-ml microcentrifuge tube. The unincorporated label is the intense band near the bottom of the gel. 12. Using a rotating mixer, elute the probe overnight at room temperature into 250 pi of 0.5 mM ammonium acetate containing 1 mM EDTA and 0.1% (w/v) sodium dodecyl sulfate (SDS). 13. Transfer 200 /A of the supernatant to a fresh tube, add 100 ju.1 of 5 M ammonium acetate and 0.6 ml of ice-cold ethanol, and place the tube on dry ice for 10-15 min, until frozen. 14. Centrifuge for 15 min at 4° at 2000 rpm, rinse the pellet with cold 70% (v/v) ethanol, centrifuge for 5 min at 2000 rpm, and air dry the pellet. 15. Resuspend the labeled RNA in 50 fi 1 of water and count 1 /xl in scintillation fluid. Adjust to approximately 5000 cpm//xl and store in aliquots at —80° for up to 1 week. 1. Add 600 pi of digestion buffer [10 mM Tris HC1 (pH 7.5), 400 mM NaCl, 0.1 mM EDTA, and 0.6% (w/v) SDS] and 35 /zl of proteinase K (10 mg/ml) to a microcentrifuge tube containing a tail clipping (about 1 cm). DNA recovery from adult mice is not as efficient as from newborn mice. Three-week-old mice are best for obtaining samples. 2. Place at 50-65° overnight until all tillus is gone (hair will remain). 3. Add 200 pi of 5 M NaCl; vortex and centrifuge at maximum speed for 5 min. 4. Transfer the supernatant to a fresh tube and add an equal volume of ice-cold ethanol. 5. Freeze on dry ice and then centrifuge at maximum speed for 20-25 min at 4°. 6. Rinse the pellet with 70% (v/v) ethanol and centrifuge for 5 min. 7. Discard the ethanol and air dry the pellet briefly. 8. Resuspendin 500 fil of water or TE [lOmMTris-HCl (pH 7.9), 1 mMEDTA] and quantitate by UV spectroscopy. Because the DNA is of high molecular weight, resuspension usually requires an elevated temperature (37°) and several hours for completion. The protocol is designed to differentiate HO-2 Tg mice, using DNA prepared from tail snips, and to determine whether the animals are homozygous or heterozygous. HO-1 is used as a copy number control and primers are selected such that the HO-2 primers would be separated by an intron in the genomic DNA and thus the endogenous copy either does not generate a product or produces one significantly larger than the transgenic cDNA copy. HO-1 primers come from the same exon, so they produce the same size product as the cDNA would. A similar approach can be used for any transgene as long as the information about the organization of the gene and sequence is known. 2. Split the reaction into four tubes of 25 ¡i\ each and overlay with mineral oil. 3. Thermocycling parameters are as follows: an initial denaturation at 94° for 1 min, and then cycles of 94° for 35 sec, 57° for 35 sec, and 72° for 35 sec. 4. Aliquots are removed to ice and stopped after 18, 20, and 24 cycles. 5. Products are separated on a 2% (w/v) agarose gel in lx TBE and are quantitated by laser densitometry of negatives from the stained gel. Bile pigments and CO are formed in the course of heme degradation by the isozymes and are biologically active moieties. In the course of heme degradation the chelated iron is also released. Heme and iron are prooxidants, whereas bile pigments are antioxidants. In addition, CO functions as a signal molecule and HO-2 may serve as an intracellular "sink" for NO. In the balance, the published data suggest that the HO system functions in cellular defense mechanisms. The methods described in this chapter can be used to assess the tissue/cell toxicity of chemicals in general, and as pertains to the defense activity of HO-1, specifically. This research was supported by Grant NIH ES04391.1 am grateful to Suzanne Bono for preparation of this manuscript. 36 W. K. McCoubrey, Jr. and M. D. Maines, Gene 139, 155 (1994). 37 R. M. Müller, H. Taguchi, and S. Shibahara,./. Biol. Chem. 262, 6795 (1987).